New in 2017, we were thrilled to work with Western Michigan University (WMU) to bring the Youth Collaboration Award to ArtPrize Nine – offering any school or eligible non-profit organization serving K-12 students the opportunity to enter a collaborative piece into the ninth annual event and compete a $5,000 cash prize. I recently sat down with Maggie Bandstra, Hudsonville Public Schools Art Department Chair, to learn more about the district’s journey participating in ArtPrize Nine, all the way to the Ninth Annual ArtPrize Awards where their entry You Be You took home the inaugural Youth Collaboration Award. Below is a transcript of that conversation. Becca Guyette: What’s your past involvement with ArtPrize? Maggie Bandstra: I have entered a piece of art in ArtPrize every year since the beginning. Participating in ArtPrize as an artist has been an amazing experience that helped me grow and improve as an artist. I made new connections after the first ArtPrize, I met Linda and Scott Lafontsee and began working with them and my students to create many of the paintings in the Helen Devos Children’s Hospital. After year three, I met Fred Bivins an amazing advocate for the arts and artists in Grand Rapids. I reconnected with Richard App and began working with Richard and showing my work in his gallery. As an art educator, I have always wanted for my students to participate in ArtPrize, but the ArtPrize rules did not allow for students under the age of 18 to participate. After reading that the Youth Collaboration Award would allow my students the opportunity to enter a collaborative piece, I immediately asked my colleagues if they would like to participate, sought approval from the Hudsonville Superintendent Nick Ceglarek and asked students (grades k-12) if they wanted to be part of ArtPrize Nine. Everyone was super excited so we got to work planning our project! BG: How did the Youth Collaboration Award opportunity change your students' ArtPrize experience? MB: Many more students went to ArtPrize with their families and they were much more engaged. Some of the parents told me it was like a Hudsonville reunion around our entry as families came together with neighbors and friends to try and find their child’s fish. I love when art brings communities together. Over 5000 students worked on the collaborative entry. They were proud of their work and excited to show friends and family the final piece, finding their individual rock in a sea of 6,000 was a fun way for families to spend time together at ArtPrize. The most successful part of the learning experience was our 5th graders, who got to experience the hard work and planning that goes into installing art. Installation day was an awesome field trip and hands-on learning opportunity for my students especially the teamwork that was involved, we had over 150 students working together, it was a great way to kickoff the school year. Check out the video. BG: What was your planning process, and how were students involved in planning, making, installing, and displaying the work? MB: It was a collaborative effort between the art educators in the district and students. As an art department, we discussed possible ways we could incorporate all of our students in the work of art and connect it into our curriculum. There was no budget for the project, so we needed to use materials that were readily available or donated. One of our 5th-grade teachers, who also owns a landscaping business found the rocks and they were donated by Huizenga Gravel Co. He delivered them to the school and all the art teachers in the district took the rocks back to their schools. Each classroom studied the book, "Only One You" by Linda Kratnz. Our art teachers talked with students about the book’s messaging and why it was the inspiration for our collaborative piece. 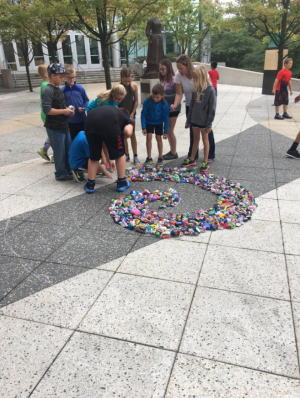 Students were thrilled and excited to be part of a collaborative piece for ArtPrize Nine. The curator, Eddie Tadlock was kind enough to accept our entry at DeVos Convention Center, it was the perfect fit. The fish made from the rocks were placed by the river, representing a school of fish. We decided to have two of the seven schools bring students to ArtPrize to install the work. Students helped place the rocks and then they got to take a little walk around Grand Rapids to see the other artists installing their work. The week before ArtPrize starts is always my favorite time at ArtPrize, it is so interesting to look around and meet the other artists installing their pieces I am really glad so many students got to experience it. BG: What’s your district's plan for the $5,000 award? How do you see it directly impacting your students’ education? MB: In the past, it has been a struggle to find funding and support for art education field trips. In fact, I have only brought my students to ArtPrize once prior to entering the youth collaborative piece. That is why the art department and district is so thankful for the award money! It will be used to fund a district-wide annual third grade art education field trip! The funding will help for approximately ten years of field trips for Hudsonville Public Schools. I am really excited our students will be able to experience the wonderful art in our community first hand. BG: Why are art field trips so important to a child’s education? MB: Seeing art in person is very different from seeing it in a book or on a screen. I like to describe to my students the time I was at The Huntington Library in San Marino and saw my first Mary Cassatt Painting. It was such an emotional painting of a mom and child sitting on a bed. I teared up. Prior to seeing that painting I was not a huge Mary Cassatt fan. I will always remember the unexpected emotion I felt when I saw it. I want my students to have these types of connections with the art they see. BG: Where’s the work You Be You located now? MB: The entry has continued to inspire our community. The rocks have been in the parks around Hudsonville. Families and teachers hid them for people to find, post on social media and then rehide. The rocks painted by Georgetown Elementary Students were also used in a landscape project near their building’s entry to brighten the walkway of their school. BG: Please tell me about your journey as an artist and art educator. MB: In January of 1998, I was hired along with Josey Brouwer to start the Elementary Art Program in Hudsonville. I had moved to Grand Haven from Chicago, where I was teaching 4th Grade for Chicago Public Schools and working in a pottery studio In Oak Park Il on the weekends. As department chair and full-time art teacher, I watched our little group of two art teachers grow to eight as the district grew and the program expanded. It is a joy to spend the last 20 years working at Hudsonville Public Schools and teaching so many amazing young artists! In 2007 I started creating my own art again, making and showing my artwork helped to reignite my passion for all that the arts could do for a person. In 2008, I built a studio above my garage and I have been making art on the weekends and evenings alongside my day job ever since. In April of 2017, I opened 7th Street Gallery in Grand Haven and I also work with the Lakeshore Visual Arts Collective, a new non-profit that I started in 2016.